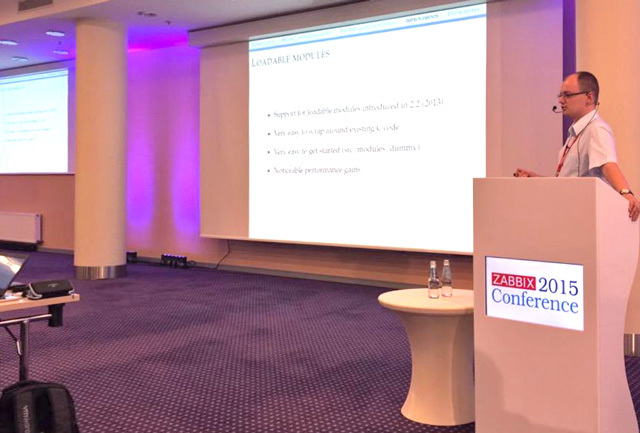 The conference was opened with a speech by Alexei Vladishev glancing over the accomplishments Zabbix made during the past year, mostly focusing on the exciting features and improvements that await us all in the Zabbix 3.0 release. Let’s mention only two of the newest features coming in 3.0: built-in encryption and authentication as well as problem and trend prediction. All of us are eagerly waiting for Zabbix 3.0! First run of great talks followed, starting with a technical explanation on a Python wrapper for Zabbix loadable modules by Vladimir Ulogov, the Zabbix technology evangelist, representing Zabbix in our office in New York. The wrapper allows to collect data on the agent side with Python code snippets while utilizing loadable module functionality. The talk is a great way to start to learning how to extend functionality of Zabbix using code written in Python. It takes a few lines of code to get access to all power delivered by Python and its extensive libraries. Andrew Nelson from RedHat took the stage and covered the basics of SNMP explaining why and how one would use SNMP agents for monitoring. He demonstrated how the standard SNMP agent can be extended with scripts to return additional performance and availability data. 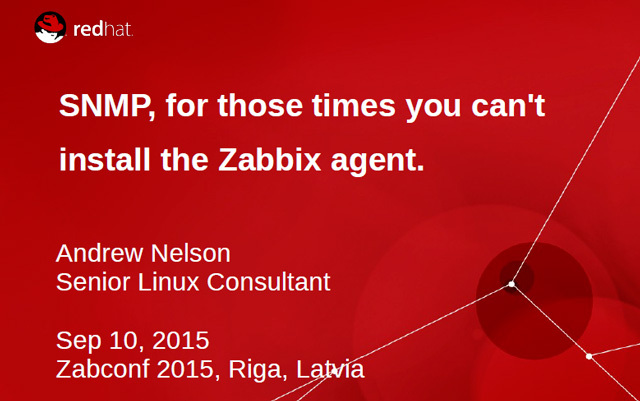 Great talk for those considering deploying Zabbix in SNMP-only environments. Raymond Kuiper demonstrated a collection of small utilities that allow to manipulate Zabbix configuration from a command-line – an attractive promise for Unix professionals. Quite complex real life scenarios can be scripted in a very transparent way! His slides were filled with gnomes… why so? 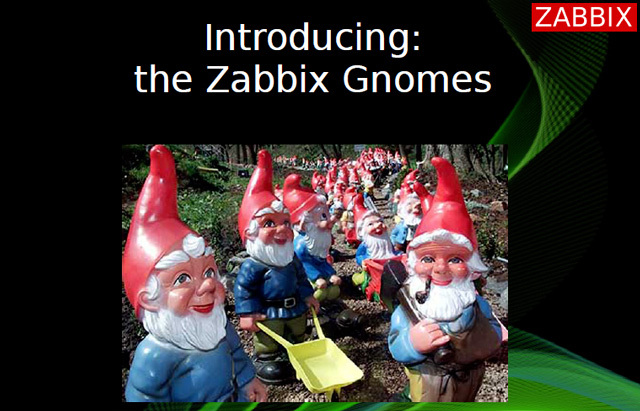 Because those utilities are called “Zabbix gnomes”. Why are they called like that? Well, we’ll keep that as a small secret that was revealed in the talk. Several case studies were presented on the first day. The first one covered Zabbix monitoring large enterprise infrastructure having high-end IBM storage systems and Brocade switch SANs at a large Italian bank was presented by Dimitri Bellini and Stefano Zuliani, describing the steps taken to enable monitoring in a distributed and critical environment, and explained why Zabbix is a great and flexible solution. 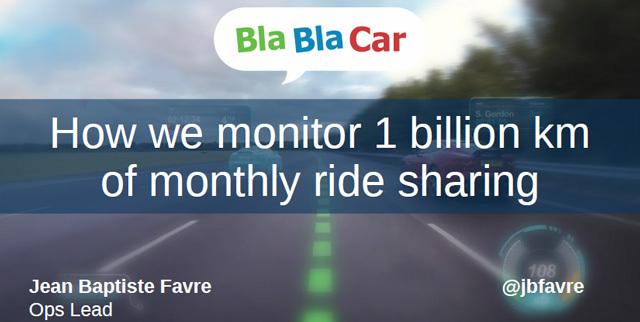 Jean Baptiste Favre from BlaBlaCar continued with an impressive case study, explaining the struggle with ever growing requirements to monitor an always expanding environment of BlaBlaCar, well known ride sharing service. Examples of RabbitMQ and MariaDB monitoring were explored, and integration with Grafana for extra visualisation was demonstrated. Having successfully arrived all the way from Japan, Daisuke Ikeda demonstrated superb level of automation and integration of Zabbix with cloud services and virtualisation platforms including Amazon AWS. 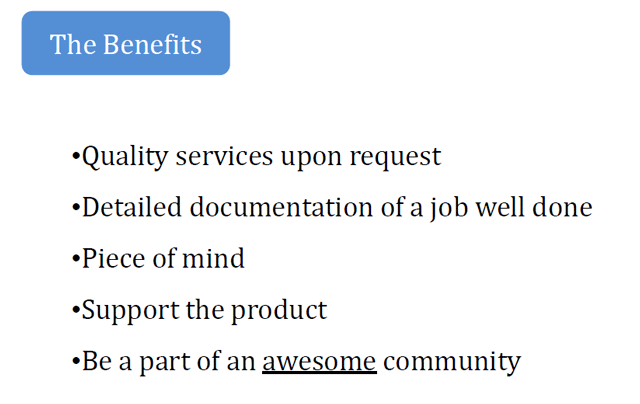 And the great thing is that all of the features are available for everybody through the Open Source HyClops project. 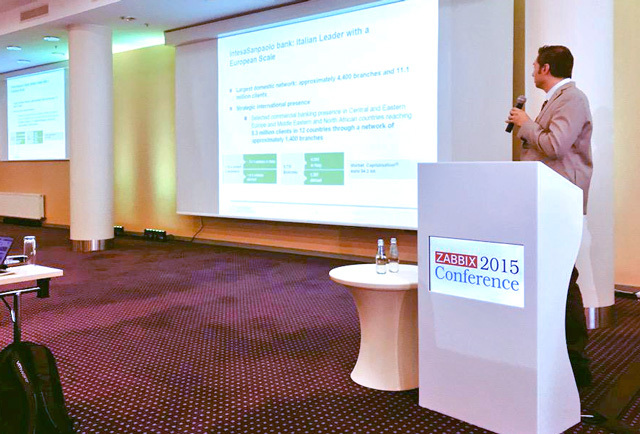 From a not-that-distant-places, Lukasz Lipski of Nordea Poland covered the practical side of monitoring payment queues. In this talk, we learned about the details of IBM MQ monitoring. The final case study of the first day was presented by Filipe Paternot from Globo.com – a major media player with more than 45 million unique visitors, daily. Challenges, migration from other tools, integration effort and the chosen solutions were discussed. 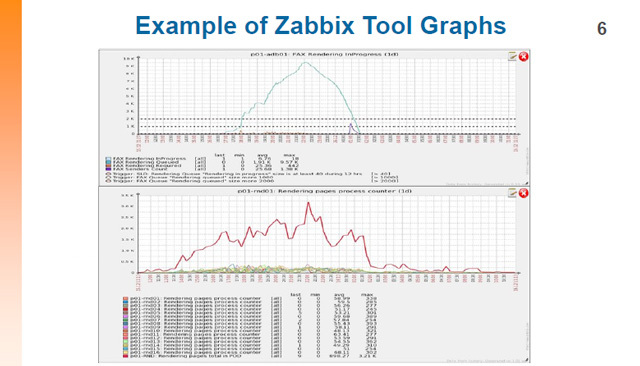 Serg Mescheryakov from RingCentral demonstrated a tool that allows much easier and streamlined configuration of graphs in Zabbix – something Zabbix developers paid close attention to and planned future improvements. 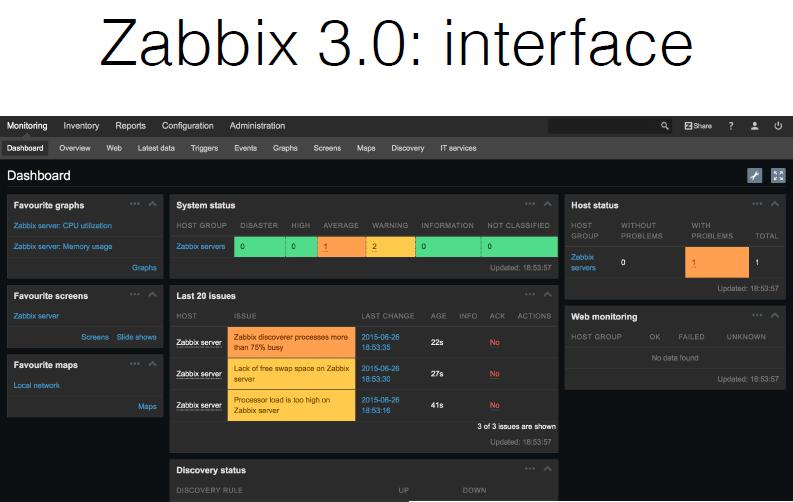 Two Zabbix team members concluded the day – Rihards Olups attempted to explain the carefully developed upcoming built-in Zabbix 3.0 encryption between all Zabbix components including server, proxy, and agent daemons. Zabbix sales wizard Alexander Sergunin enlightened participants on the ways they could benefit from Zabbix services like turn-key deployment, upgrade services and template development. 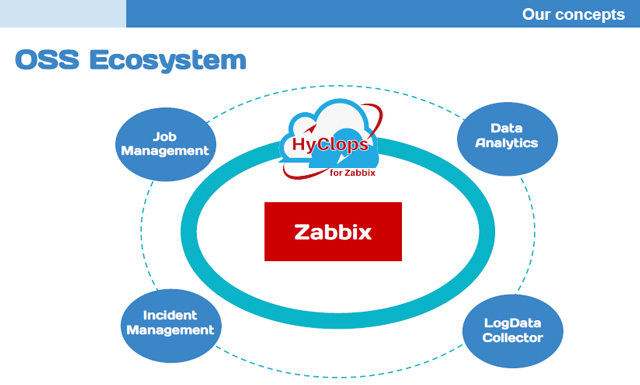 Extra care was taken to highlight the high professionalism of the support team and this statement was backed with examples of Zabbix experts solving various complicated cases for Zabbix support agreement holders. 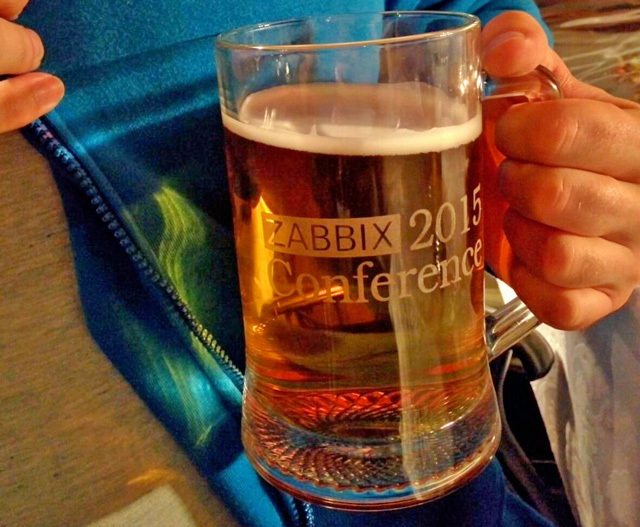 Zabbix conference agenda has a lot of educational and inspirational talks to offer, but we are sure that great ideas and discussions spark during the breaks and fun-program events. After the talks we headed out for Old Riga and the cozy atmosphere offered by Gutenbergs Hotel rooftop patio, providing a breathtaking view over the nightly city. This event always gathers all of the conference participants together for engaging contests, conversations with old and new found friends and pleasant surprises.